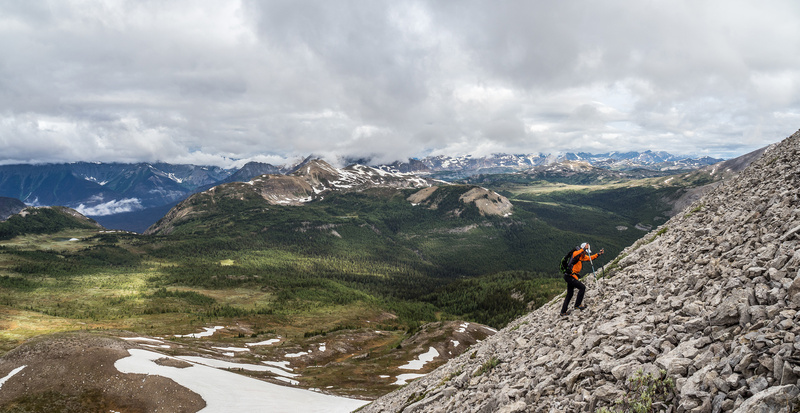 Difficulty Notes: Easy hiking and scrambling with some easy routefinding to the summit. A long day from the Sunshine parking lot. 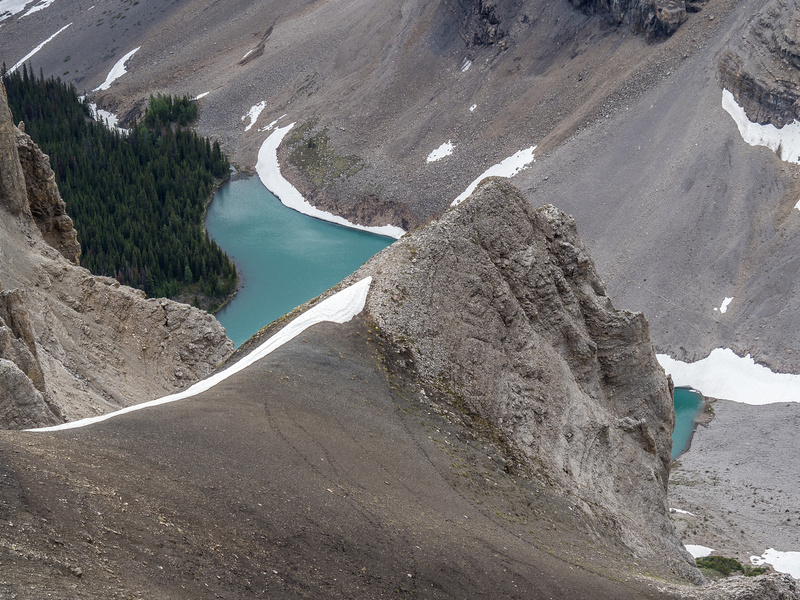 While standing on many of the peaks lining the Sunshine Meadows area in Banff National Park, one’s eyes are naturally drawn towards the line of summits from Howard Douglas in the north to Fatigue and Golden Mountain in the south towards Mount Assiniboine Provincial Park in British Columbia. 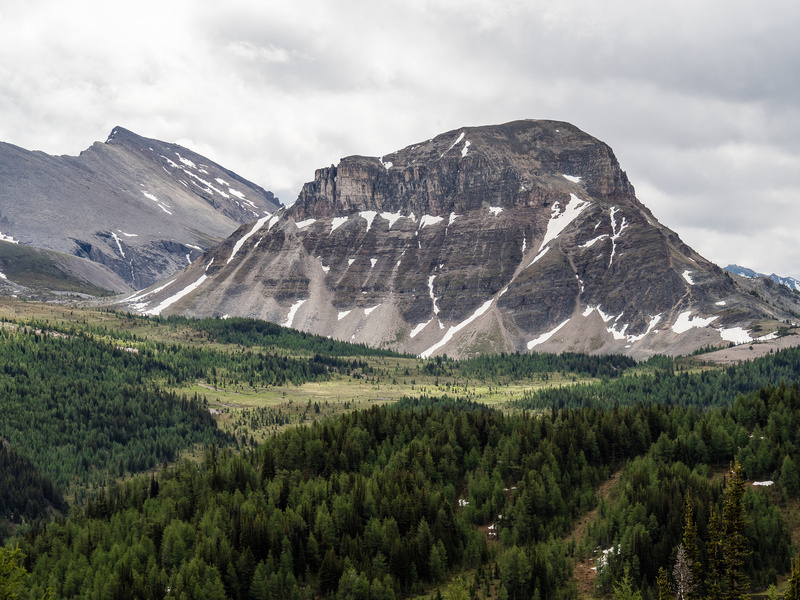 Right in the middle of all of these fairly significant peaks on the Continental Divide lies an unnamed peak at just over 2900m high. For years now, I’ve looked at this summit and wondered two things. Firstly, why isn’t such a prominent peak named? And secondly, how hard is it to scramble? I now know the answer to question number two and have solved the issue of question number one myself. 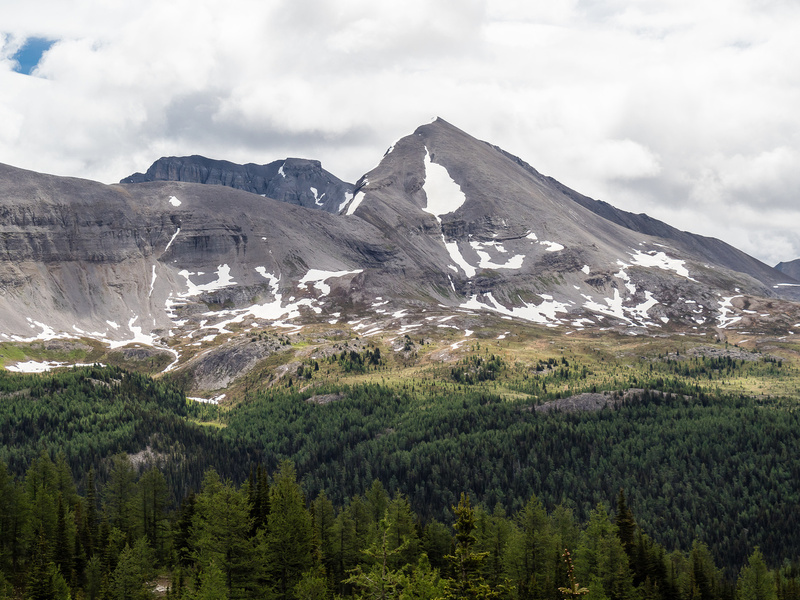 When doing research for our upcoming peakbagging trip around the Fatigue Pass area, Phil and I had given Quartz Peak only sideways glances, partly due to the fact that it was unnamed and partly because it was unknown (to us). I should have done more research and could have realized how easy it was from Andrew Nugara’s guidebook, but for some reason I didn’t. Oh well. After bagging all three of our main objectives on the first day (!! 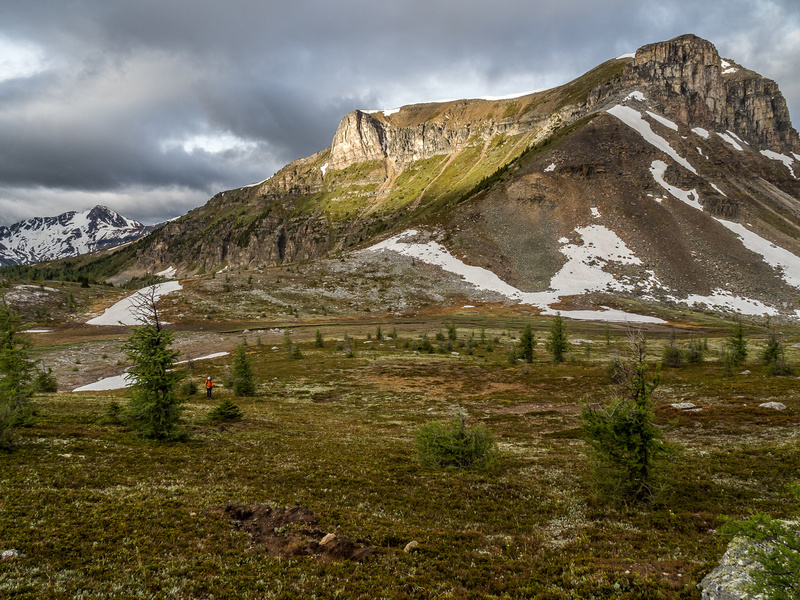 ), including Fatigue, Citadel and Golden Mountain, we were feeling a wee bit diminished when we awoke with daylight at around 06:00 on Saturday morning of the last day of June 2018. 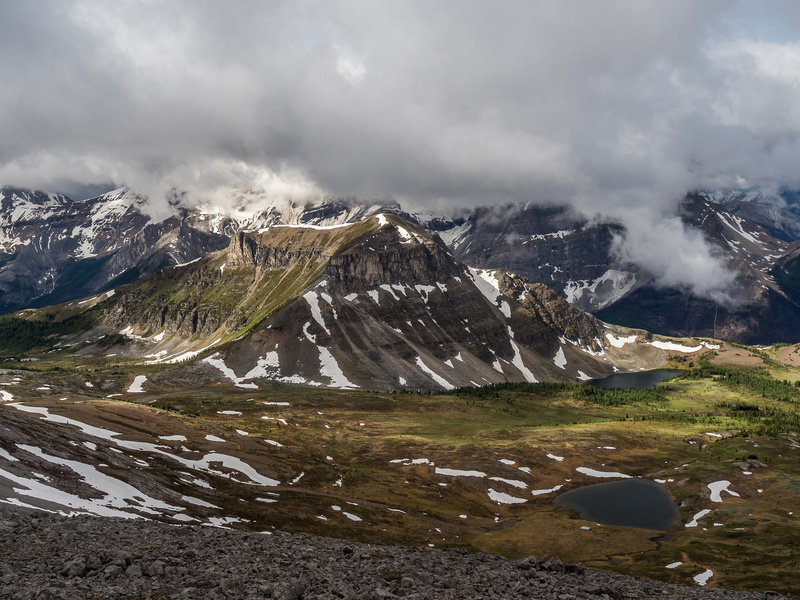 It didn’t help our energy levels that a thick coat of cloud lingered along the Divide and into the valleys. We were thankful that we pushed hard to get Golden Mountain with some pretty sublime views the evening before rather than slogging up it this day with restricted views. But. There was still another peak we could do! 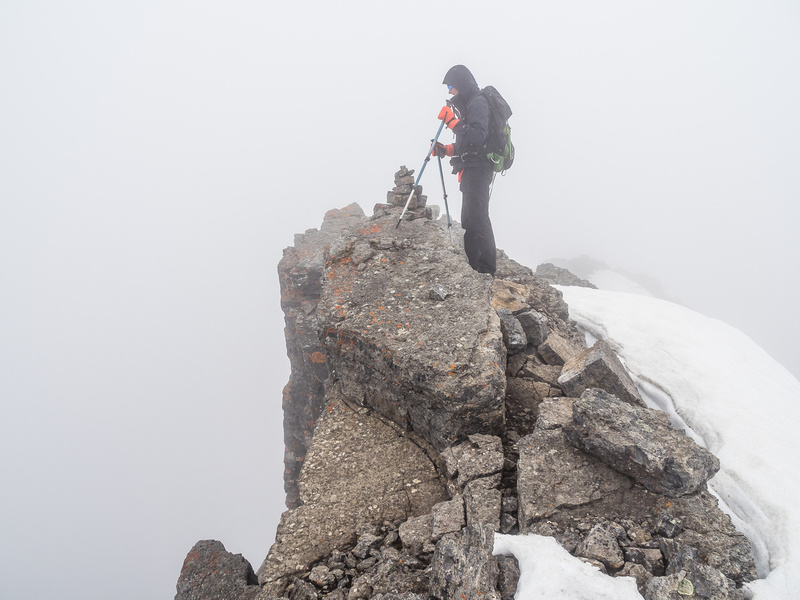 It took some serious motivational speaking on my part, but eventually I convinced Phil that even if the summit views were nonexistent, it was worth giving Quartz a shot. We’d have views on the ascent and who knows? We’d gotten pretty lucky so far! Plus, we were already going home a full day early and had zero reason to get to the parking lot at noon so why not just do the 500m slog and see what happens? 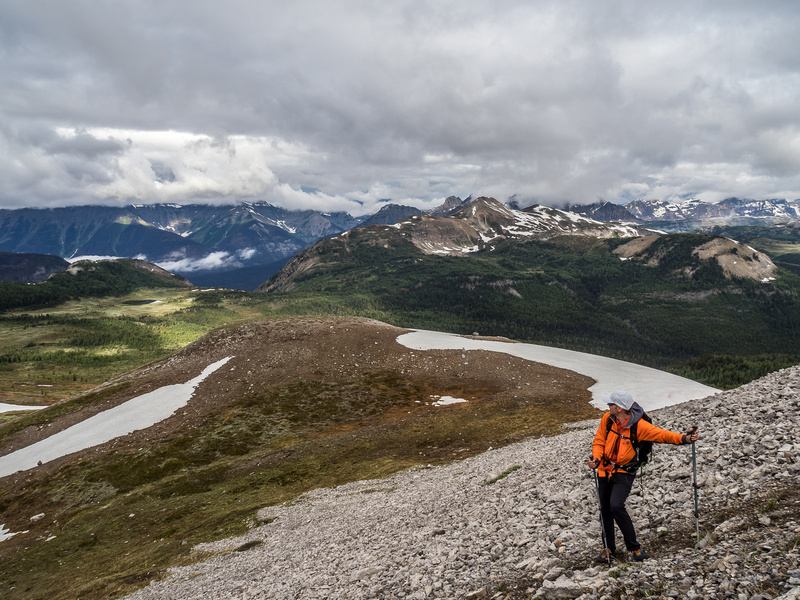 We slowly packed up our damp camp before shouldering the full packs and heading up and over the pass towards Citadel Pass. 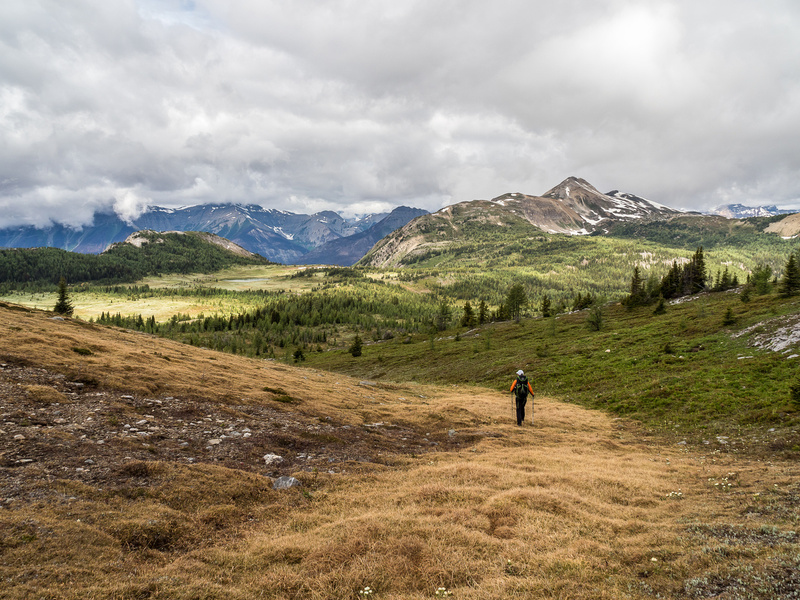 It was a beautiful morning with a cool breeze and moody scenery all around us as we crested Fatigue Pass and found the trail down towards Citadel Pass below. 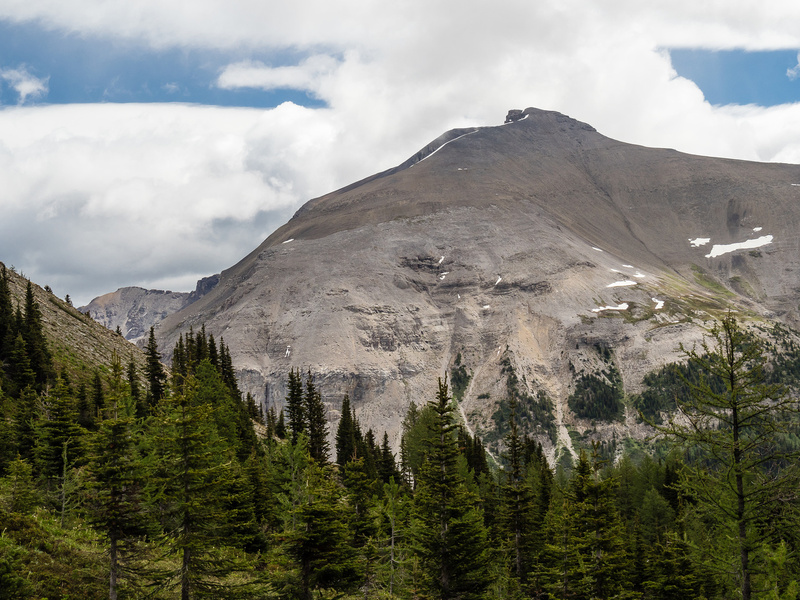 We passed below the familiar form of Citadel Peak before traversing cross country towards the west face of Quartz, looking for an obvious ascent line. As we traversed we noticed that the mountain was covered in a pretty good layer of clouds that didn’t seem to be lifting any time soon. We persevered onward – there was no turning back at this point. 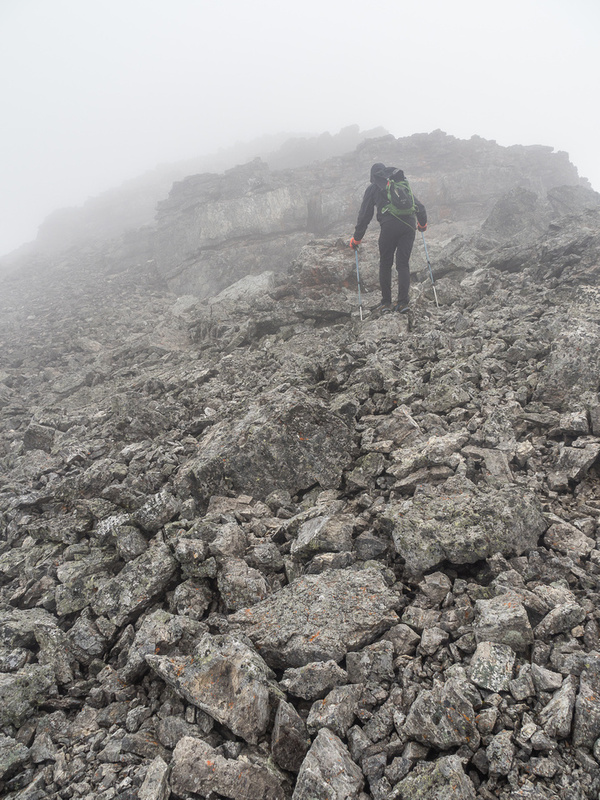 Eventually an obvious access to the south ridge appeared in the form of an easy angled scree slope. We dropped the heavy packs and ascended the slope easily, albeit slower than usual with our tired bodies. 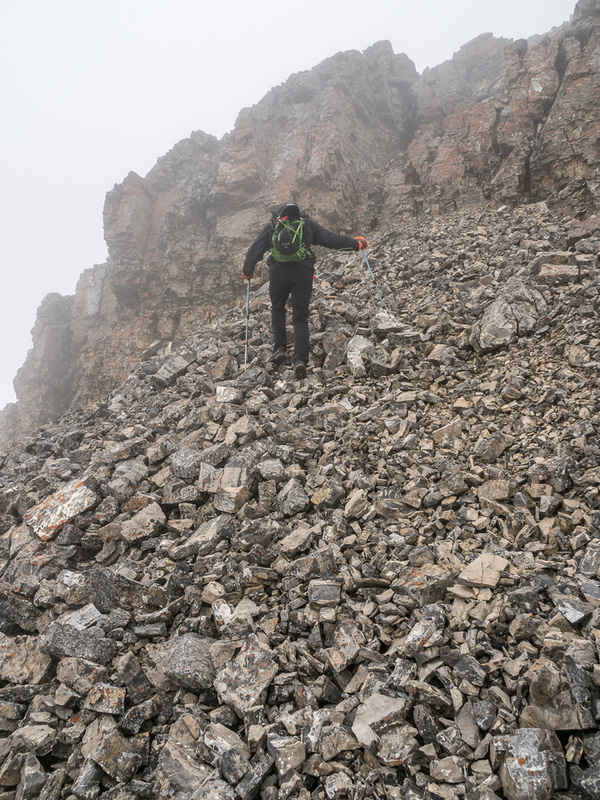 The scree slope wasn’t as treadmill as it appeared and it didn’t take long before we were on the ridge looking forward to a cloud covered summit block ahead. It was at this point that I recalled an old trip report from Andrew Nugara and wondered aloud if this peak was in his book. (When I returned home I immediately looked it up and indeed, he did Fatigue and “Little” Fatigue in one long day.) We had no idea if it would go or not, but we knew if it did there’d be a false summit with an easy bypass on the south (climber’s right) to the summit beyond – my GPS topo showed this quite clearly and we’d seen glimpses from Fatigue the day previous. Just before entering the clouds on the south ridge we were treated to not only one beautiful little tarn, but two of them tucked against the east cliffs of Quartz and Fatigue. Looking back at Fatigue Pass with Fatigue Mountain at left and Golden Mountain at right. Phil grinds his way up the fourth summit in 24 hours. Quartz Hill at distance center here. 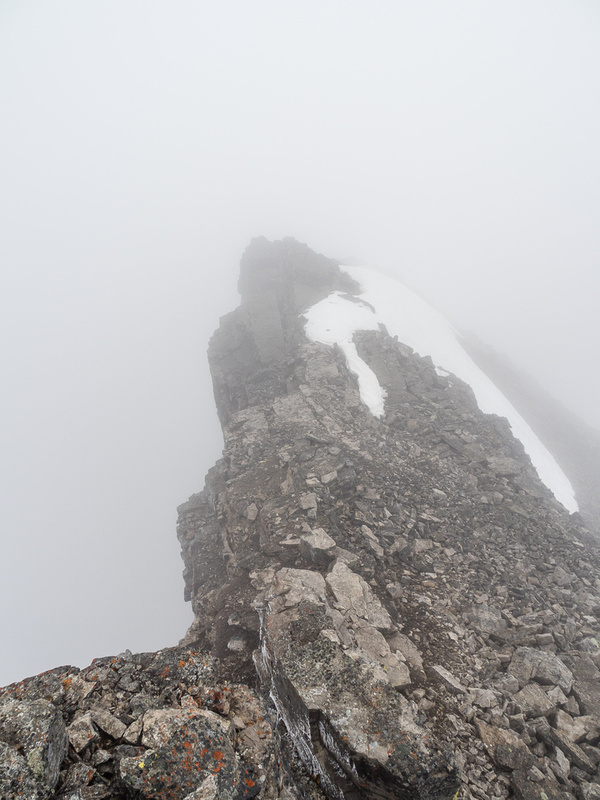 On the south ridge proper now, looking at a summit block covered in thick clouds. Entering the clouds, looking over the two lakes. The one at left is as bright as a mirror, reflecting the morning sun. 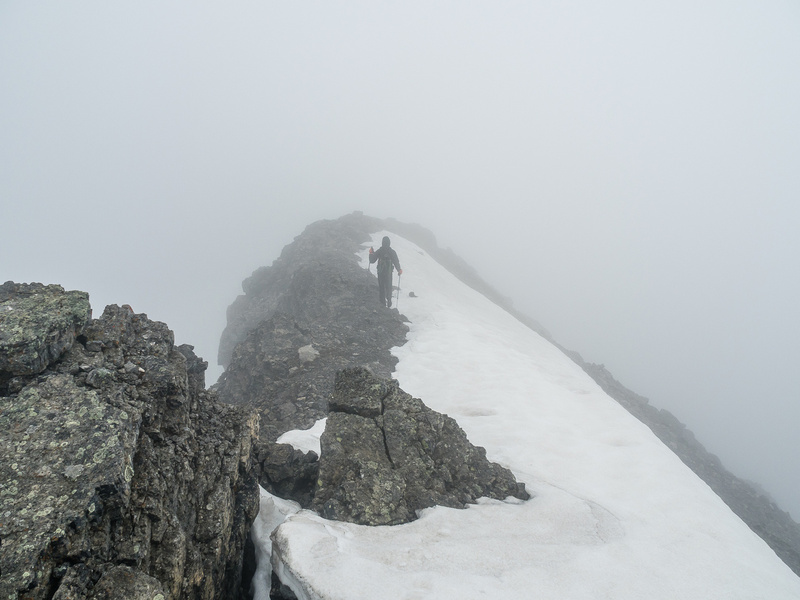 Once we ascended into the clouds, the trip took on a rather surreal and dreamy quality. It’s hard to explain, but with our tired minds and bodies, the terrain took on a very mysterious and mystical feel which was quite unique. Phil and I don’t often do trips in “bad” weather, so we were learning a lot on this one, including the fact that even limited views can be very interesting and worthwhile to experience. 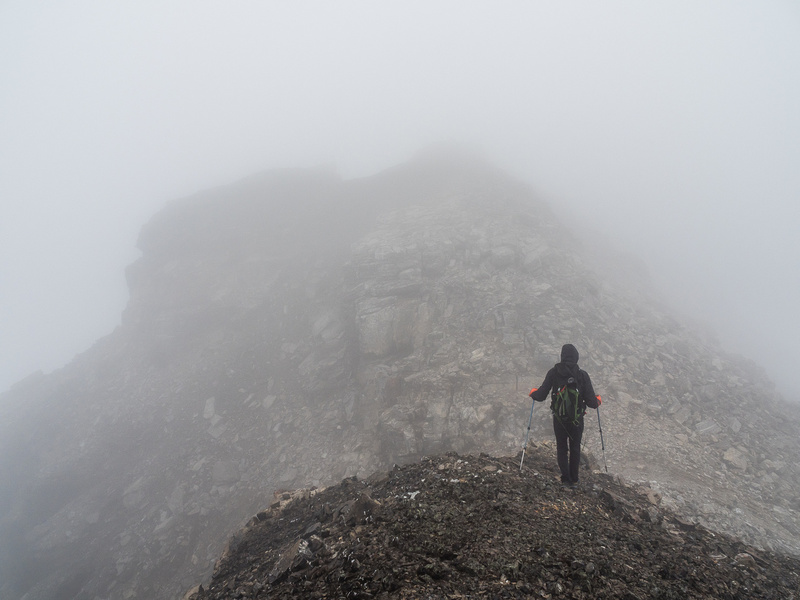 A rock band loomed in front of us, rising out of the mists, but we easily ascended it on easy scrambling terrain. From here we scrambled to the false summit, noting a higher point on a narrowing ridge ahead that we assumed to be the highest point (since it was past the false summit). I’ll admit that in the thick fog and without any visual cues of any other high points nearby, I had a bit of a brain fart at this point. As we easily ascended the narrow ridge to the high point, I didn’t bother glancing at my iPhone to ensure we were indeed on the highest point. Phil even walked a bit further along the ridge, affirming that there was nothing higher in front of him. 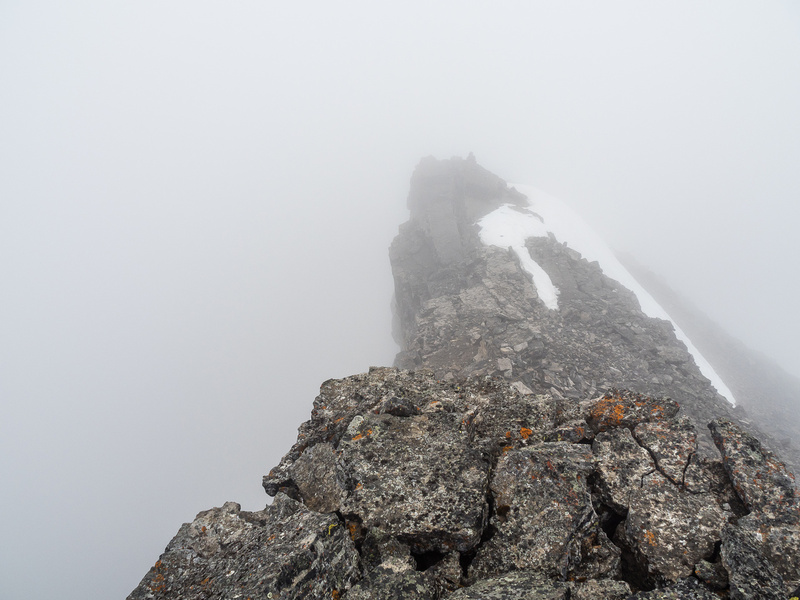 We snapped some photos in the gray emptiness around the summit and both of us commented how we could feel the incredible exposure pulling at us from the north side of the ridge. As we descended past the false summit I found a massively exposed and deep cleft which gave another gut-pulling experience as we stood over it. We found an easy bypass to the “crux” rock band and it was only here that I bothered looking at my GPS to find our ascent line on the south ridge so we could follow it back down. It was also only now that I told Phil we might not have actually been on the true summit! Dammit! I hate it when that happens! On hindsight, I likely would have turned around and reascended at this point if I’d had a clearer head, but we were already about 100 vertical meters down the mountain at this point and still in thick clouds so it just didn’t feel worth the bother. I obsessed about the near miss for a good ways back since I wondered how the traverse terrain was rated. If the traverse was difficult, and we didn’t do it, than we couldn’t really claim the summit. 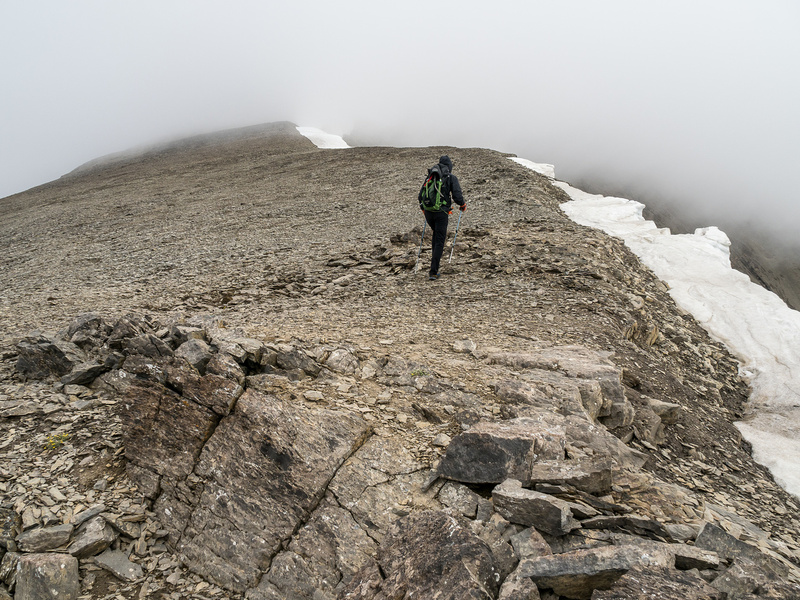 Now that I’ve done more research and realize at most we missed a short, easy bypass and a short trudge up only a few extra few meters (if that), only to view more of NOTHING given our cloud blanket, I don’t feel as bad about claiming Quartz Peak on my summit list. Traversing from the first false summit to what we thought was the true summit block. The true summit requires dropping down a bit to the right here and going just a bit further before ascending back left. Phil on our summit. It certainly felt very exposed – the huge openness to the left pulled at us as we stood there. 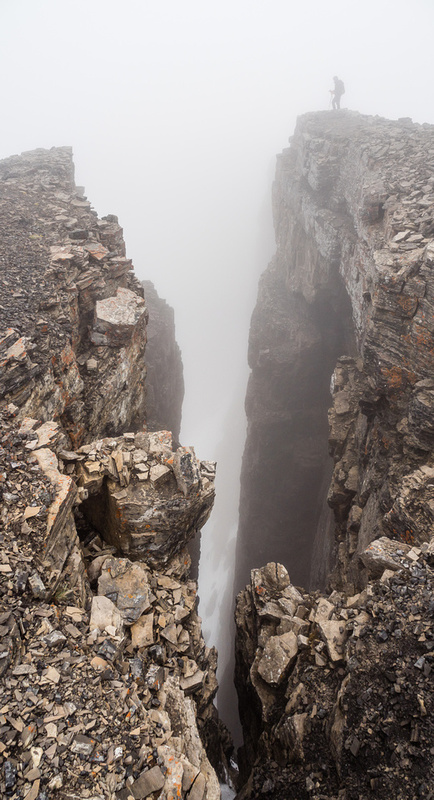 The massively exposed cleft just beneath the first false summit. The two lovely tarns sit just east of the Quartz (L) and Fatigue (R) col.
On descent we slowly exited the could cover before following our ascent line down to the waiting backpacks and the rest of our gear. From here it was a rather mind numbing trudge back over the Quartz Hill shoulder and then all the way back down the Sunshine Village road to the parking lot. Yes, we could have taken the gondola, which was now running, but it felt wrong to take it down since we didn’t take it up. The road was easy anyway and completed a nice weekend. 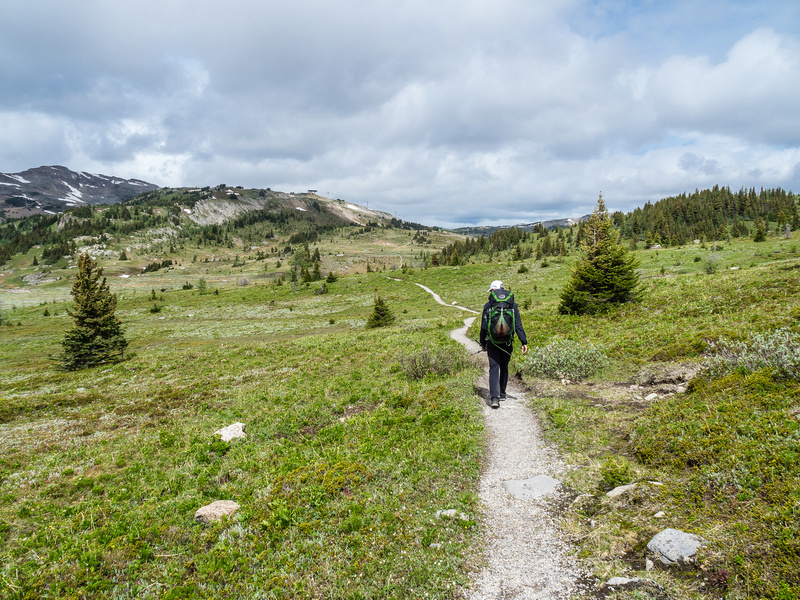 Hiking back across the alpine meadows to the main trail which is left of us here. The scree summit of Quartz at extreme left with our high point looking very close to the same height just right of it. Fatigue, Golden and Citadel to the right of Quartz with Quartz Hill and Ridge at right. I highly recommend Quartz Peak, especially if you’re camped at Howard Douglas or find yourself hiking Citadel Pass as a day trip. To be honest, the south ridge is more fun than the north ridge of Fatigue and the upper mountain has some pretty nice terrain. I’m sure the views are spectacular too, and I’ll almost certainly be going back to see just how much higher the north summit is than our high point and to take in some of the vistas that I know we missed out on. Looking back over a Grizzly digging towards Phil as we start our traverse to Quartz. Citadel Peak catching some morning lighting behind us. Quartz Hill at distant left with the peak at upper right in clouds. Looking over the saddle as we start up the scree grind to the south ridge. There was very little wind and the hiking on the south ridge was very pleasant. We both commented that this was the best hiking we'd had on any of the four peaks of the weekend. 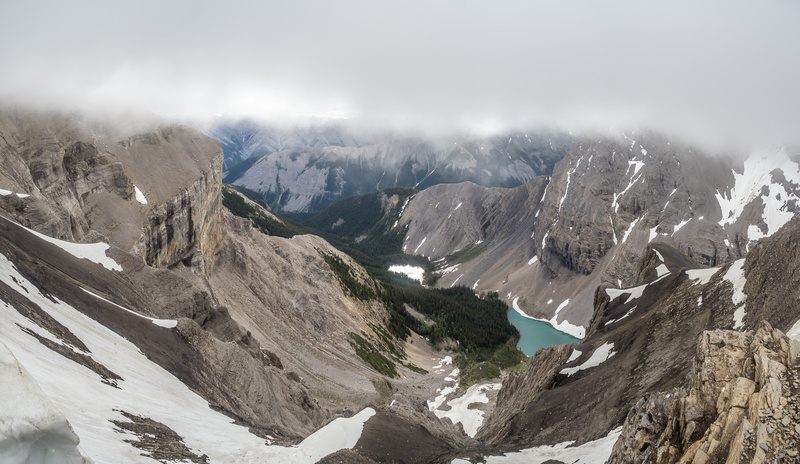 Great scenes down the east face, up to the summit (L) and back south towards Fatigue Mountain (R) before we enter the clouds. 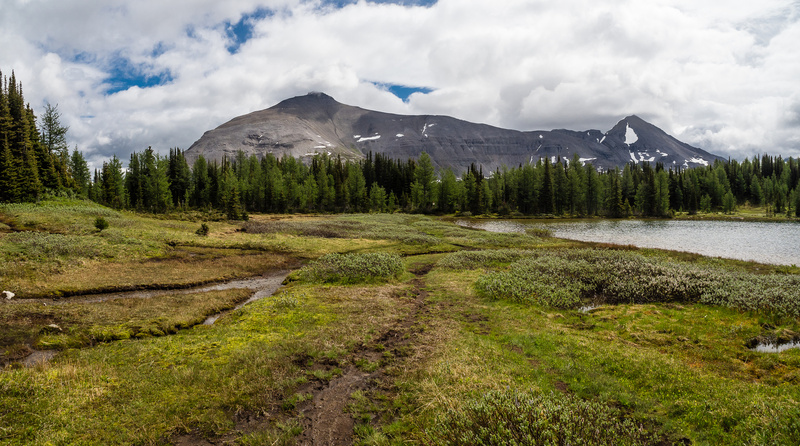 Sheep trails and the beautiful hidden little lake. The trip takes on a dreamy quality. The only real scrambling on Quartz is avoidable on climber's left but this is easy and fun so why avoid it, especially on ascent? Approaching the first false summit. Sensing a heckuva drop on the left here as we approach our "summit". Phil continues along the ridge from our high point just to make sure we're on the highest point. He couldn't see 25m ahead of him or he'd have known we had a few more meters to go! Phil on our summit. It certainly felt very exposed - the huge openness to the left pulled at us as we stood there. Looking back at our summit as we retreat along the ridge. Descending back to our big packs. At Howard Douglas Lake looking back at two of the four peaks we just did - Quartz at left and Fatigue at right. We made it to the highest point on Quartz Peak that is visible here and possibly even a bit beyond that on the ridge. A last look back over the Sunshine Meadows with all four of our peaks visible.